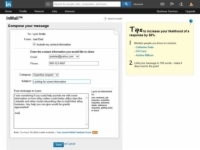 If you’re looking to connect with someone on LinkedIn right away and you don’t have an immediate or secondary connection with someone, you can use the InMail feature to send a message directly to another LinkedIn member without anyone else getting involved. This feature is currently available to paid members of LinkedIn with available InMail credits. If you’re using a free account, you have to pay for individual InMail credits to reach other members through InMail. Consult the LinkedIn Help Center for more information. InMail is basically a private e-mail message that enables you to reach other members, but it protects those members’ privacy and e-mail address information. 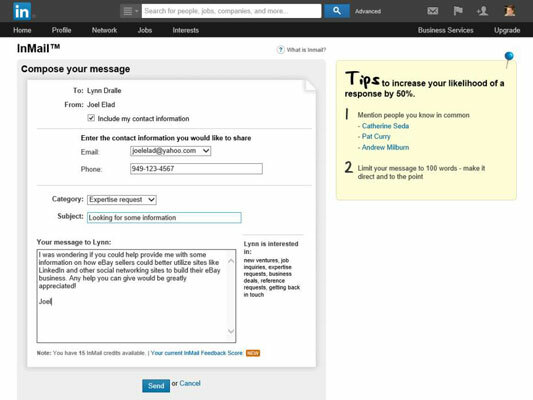 If your message is accepted, you’ll receive a message in your LinkedIn Inbox with the other party’s name and e-mail address, and you can communicate further. In some cases, you see only the other person’s professional headline first, and then you see the person’s name after he accepts the InMail message. 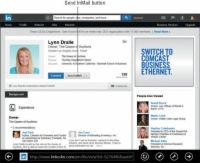 1While logged in to LinkedIn, search for the person you'd like to meet. 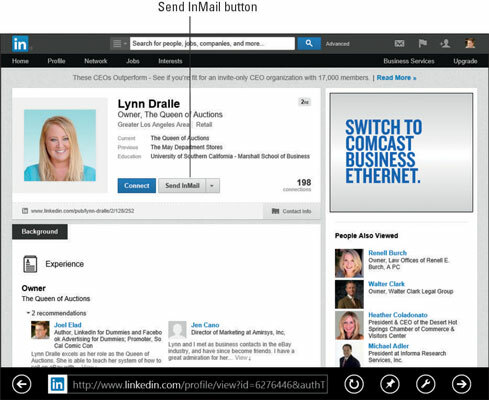 You can use the Search box at the top of any LinkedIn page, or you can click your Contacts and search your friend’s networks. You’re taken to the person’s profile page. 3Click the Send InMail link. For example, suppose that you want to connect with Lynn Dralle, the Queen of Auctions, who can not only teach you how to sell on eBay, but who sells more than $100,000 a year in antiques and collectibles. When you look at her profile, you see the Send InMail button, which means she is open to receiving InMail. You would click the Send InMail button to send her a message. After you click that button, you can start filling out the Compose Your Message form. 4In the Compose Your Message form, select or deselect the Include my Contact Information check box, depending on your preference. You’re asked whether to provide contact information that your recipient can use to contact you, in the form of e-mail and/or a phone number. Simply select the Include my Contact Information check box if you want to send contact information. 5Complete the Category and Subject fields, and then type a message in the text box. As with an introduction, keep your message focused on why you would like to talk with this person, and/or what information you were hoping to exchange. At the bottom, you can see how many InMail credits you have; remember that you need at least one credit to send this message. Be sure to proofread your message before sending it out. If you send a message with typos, it probably won’t help your case at all. 6Click the Send button to send off your InMail. Your recipient receives this InMail in her LinkedIn Inbox and can decide whether to accept it. (If she has configured LinkedIn to get immediate e-mails of her InMail messages, she will receive the InMail in her e-mail account Inbox as well.) If your message is accepted, it’s up to the recipient to contact you in return. Be patient.